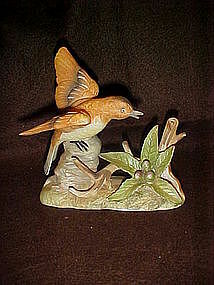 Nice hand painted bird figuine made of unglazed porcelain. Not sure of the type bird. CIC Korea sticker on the bottom/. Perfect condition with no chips or repairs. measures 5 1/4" tall and is about5 1/4" long.